June 26, 2009 by Ken Ward Jr. It will spur the development of low-carbon sources of energy — everything from wind, solar, and geothermal power to safe nuclear energy and cleaner coal. It will spur new energy savings like the efficient windows and other materials that reduce heating costs in the winter and cooling costs in the summer. Mining and utility industry folks would love us all to use the phrase “clean coal,” while environmental groups call the phrase an oxymoron. Right now, the House of Representatives is moving towards a vote of historic proportions on a piece of legislation that will open the door to a new clean energy economy. For more than three decades, we’ve talked about our dependence on foreign oil. And for more than three decades, we’ve seen that dependence grow. We’ve seen our reliance on fossil fuels jeopardize our national security. We’ve seen it pollute the air we breathe and endanger our planet. And most of all, we’ve seen that others countries realize a critical truth: The nation that leads in the creation of a clean energy economy will be the nation that leads the 21st century global economy. Now is the time for the United States of America to realize this, as well. Now is the time for us to lead. The energy bill before the House will finally create a set of incentives that will spark a clean energy transformation of our economy. It will spur the development of low-carbon sources of energy — everything from wind, solar, and geothermal power to safe nuclear energy and cleaner coal. It will spur new energy savings like the efficient windows and other materials that reduce heating costs in the winter and cooling costs in the summer. June 22, 2009 by Ken Ward Jr.
Gary Harki:Â Good afternoon and welcome. Gary Harki:Â The live chat with WVU researcher Michael Hendryx will begin in a few minutes. Feel free to go ahead and submit questions. Michael Hendryx:Â Thanks Gary for setting this up, and to everyone for taking time to participate.Â Â I’ll try to answer any questions as best I can. 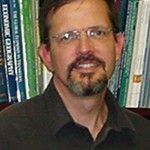 Ken Ward Jr.:Â You all can also check out our coverage of the WVU coal study on the Coal Tattoo blog. Ken Ward Jr.:Â Thanks to Dr. Hendryx for taking the time to join us. Gary Harki:Â Thanks again for taking the time to do this, Mr. Hendryx. I think we’re ready to begin. Gary Harki:Â Ken, why don’t you start us off with a question. Ken Ward Jr.:Â To start off, Dr. Hendryx, could you just give us a quick summary of your findings? 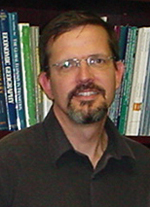 Michael Hendryx:Â It is hard to get an exact answer to that question because it is hard to separate out the effects of mountain top mining from other mining, as all forms of mining are taking place in close proximity to each other.Â Â But best as we can tell, direct effects include air pollution from increased surface disturbance (explosives, removing overburden), water pollution from drainage, stream spoilage, and water pollution from coal cleaning. Hey gang, we’ve thrown together a quick Web Chat for this afternoon with Michael Hendryx, author of the West Virginia University study examining the costs and benefits of the coal industry to Appalachia. We’ll start at 2 p.m. Visit our Web site to take part. June 20, 2009 by Ken Ward Jr.
Sunday’s Gazette-Mail includes a story I did on the latest study by West Virginia University researcher Michael Hendryx,Â who has over the last couple of years been doing fascinating and important work about coal’s impacts on Appalachia. …Questions the idea that coal is good for West Virginia and other Appalachian communities, and recommends that political leaders consider other alternatives for improving the region’s economy and quality of life. Hendryx and his co-author, Melissa Ahern of Washington State University in Spokane, compared age-adjusted mortality rates and socioeconomic conditions across Appalachian counties with varying amounts of coal mining, and with other counties in the nation. They converted the mortality figures to something called the Value of Statistical Life (VSL) estimates, and then compared that to accepted numbers for the economic benefits of the coal industry to our region. The coal industry generates a little more than $8 billion a year in economic benefits for the Appalachian region. But, they put the value of premature deaths attributable to the mining industry across the Appalachian coalfields at — by a most conservative estimate — $42 billion. The human cost of the Appalachian coal mining economy outweighs its economic benefits. In response to this and other research showing the disadvantages of poor economic diversification, it seems prudent to examine how more diverse employment opportunities for the region could be developed as a means to reduce socio-economic and environmental disparities and thereby improve public health. Potential alternative employment opportunities include development of renewable energy from wind, solar, biofuels, geothermal, or hydropower sources; sustainable timber; small-scale agriculture; outdoor or culturally oriented tourism; technology; and ecosystem restoration. The need to develop alternative economies becomes even more important when we realize that coal reserves throughout most of Appalachia are projected to peak and then enter permanent decline in about 20 years. 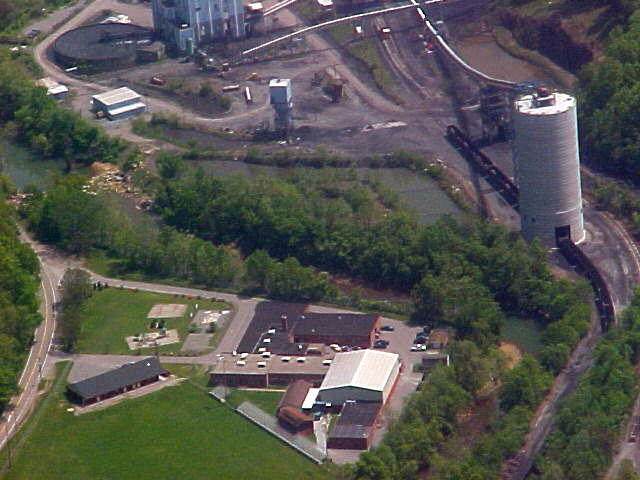 June 9, 2009 by Ken Ward Jr.
Massey Energy got one coal silo near Marsh Fork Elementary School built before activists and the press noticed the silo site wasnâ€™t within the permit boundary shown in company maps. Photo by Britney Williams, courtesy Coal River Mountain Watch. The West Virginia Supreme Court just issued a long-awaiting opinion that, in effect, says that Massey Energy’s plans for another coal silo adjacent to Marsh Fork Elementary School in Raleigh County is OK. Justices unanimously affirmed an earlier ruling by Kanawha Circuit Judge Duke Bloom, who previously upheld a decision by the state Department of Environmental Protection to authorize the silo construction. At issue in the case was whether permit maps approved by DEP or permit markers located on the ground at a mine site are the official, legal boundary of a surface mining permit. This case involves the interpretation of several statutes. The sterile, narrow legal question presented by CRMW’s appeal is simple: under the West Virginia Surface Coal Mining and Reclamation Act and the federal Surface Mining Control and Reclamation Act,Â is the â€œpermit areaâ€ of a surface mine operation defined solely by the maps submitted with the original permit application? 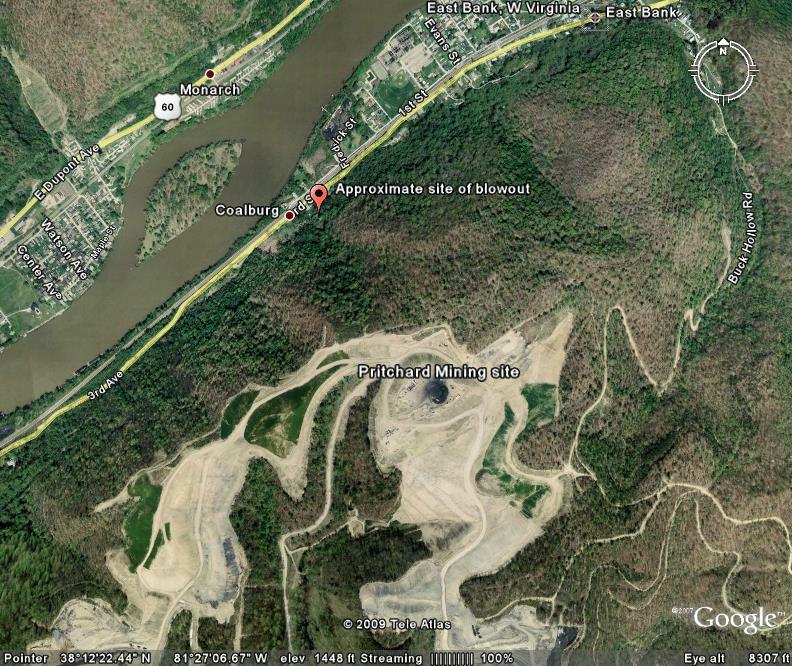 Or may the permit area be defined by reference to the maps and markers buried or installed on the mining site? Â This case does not involve the public policy effects of these Acts. We are aware of the extensive public concern about appellee Goals Coal’s decision to construct a second coal silo less than a football field’s length from an elementary school. The DEP has determined it must allow the construction to occur in deference to statutory law. The wisdom or desirability of these decisions are outside the province of the judicial branch. May 20, 2009 by Ken Ward Jr.
Coalfield politicians love to pain coal-to-liquids technology as an easy and patriotic answer to our nation’s dependence on foreign oil.Â But a new report from the National Research Council explains that, while coal-to-liquids might be part of a long-term answer, it’s far from an easy one. The report is available online here or here (depending on whether you want to pay for the .pdf file or read it free online) and there’s a press release summarizing the findings here. Liquid fuels from biomass and coal have the potential to reduce petroleum fuel use and CO2 emissions in the U.S. transportation sector over the next 25 years. Even with abundant resources in biomass and coal, however, substantial investments in research, development, and commercial demonstration projects will be needed to produce these alternative liquid fuels in an environmentally conscious way, and at a level that could impact U.S. dependence on imported oil. 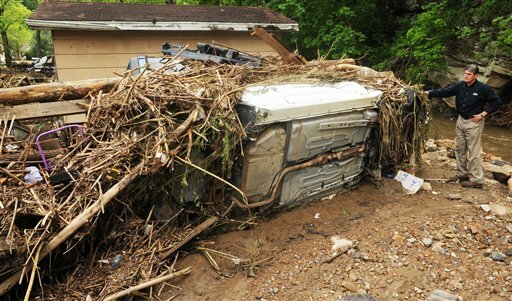 May 11, 2009 by Ken Ward Jr.
Word about the damage from the Southern West Virginia flooding is not good, especially in Mingo County. But we’re not hearing much out of political leaders about whether mountaintop removal might have played a role in this round of flooding, which hasÂ destroyed hundreds of homes and other buildings in the Heart of the Billion-Dollar Coalfield. I’ve gotten a few calls and e-mails from folks about this, and the some of the comments on out Web site are making out like the Gazette is part of some conspiracyÂ to cover this up for the industry. I’m sure there are a few coal company folks who follow Coal Tattoo who are getting a kick out of that. I blogged yesterday about the seven coal miners who were successfully rescued from a flooded undergroundÂ mine in Mingo County, and I also pointed out where folks could find some of the strong science that indicates large-scale surface mining can make flooding more likely and more damaging in places like the narrow hollows of Appalachia. Today, I tried to check on every report I got of a spot where residents felt it was obvious that a strip mine site caused or contributed to their flooding. (If you know of such a situation, please e-mail me here with the information). And so far, I’ve only been able to confirm one specific problem — near the community of Thacker, where a sediment ditch failed on Saturday, sending mining runoff pouring down and blocking a local road. It was like lava coming off the mountain, and it was coming straight toward our home. Â It was not a mudslide. It has something to do with mining. May 6, 2009 by Ken Ward Jr. This just in from the folks at Coal River Mountain Watch and the Ohio Valley Environmental Coalition: The two groups have asked the U.S. EPA and the federal Office of Surface Mining Reclamation and Enforcement to take over the West Virginia Department of Environmental Protection. I’ve posted a copy of their letter here, and I have messages out to WVDEP Secretary Randy Huffman seeking comment. 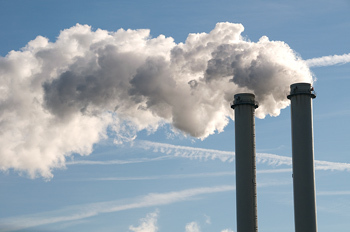 Clean Air Act and Climate Change: Killing old coal plants? April 20, 2009 by Ken Ward Jr. Readers of Sunday’s Gazette-Mail got not only my story about what the Obama administration’s “endangerment finding” on climate change means for coal-fired power plants, but also a piece by my AP friend Dina Cappiello putting congressional debate about climate change legislation into some historical perspective. (As I wrote in Sunday’s story EPA in its finding cited detailed scientific studies that project a variety of impacts from climate change, including increased drought, more heavy downpours and flooding, more frequent and intense heat waves and wildfires, greater sea level rise, more intense storms, and damage to water resources, agriculture, wildlife and ecosystems. More detailed information on the basis for EPA’s finding is available here, in the agency’s Technical Support Document. For a plain English explanation of the impacts of inaction, visit this recent post from Joe Romm’s excellent Climate Progress blog or look at my suggested reading for Rep. Shelley Moore Capito, R-W.Va., here. Capito has thrown in with the Republican leadership that continues to deny that global warming is a big problem that we must deal with right away). My story focused mostly on what the proposed EPA findingÂ eventually will mean regarding construction of new coal-fired power plants. In short, this finding — if finalized — is going to mean that, absent congressional action otherwise, EPA must set some standard for carbon dioxide emissions controls for new coal plants. What caused the East Bank blowout? April 1, 2009 by Ken Ward Jr.
We’ve had some comments on Coal Tattoo and I’ve had some private e-mail messages from folks about an important question: Did the surface mining operation on top of the hill above East Bank cause the big abandoned mine blowout that has blocked W.Va. 61 all week? I’ve been talking to some folks who live in the area and to some guys at the state Department of Environmental Protection, trying to come up with a decent answer. But I’m not sure I’ve been able to do that — yet, at least. But here’s what I’ve found out so far. The blowout occurred when an underground mine that last operated in the 1940s or 1950s filled with water. Eventually, the pressure blew a 12-foot wide and 4-foot high hole in the side of hill. Mike Richardson, a project manager with the federal Office of Surface Mining, Reclamation and Enforcement, told me he believes the blowout occurred where the hillside had sloughed down and grown over, covering the former mine opening. Contrary to some media reports, this was not simply a mudslide, and it wasn’t a case of water overflowing a mine portal. March 29, 2009 by Ken Ward Jr. Readers of today’s Sunday-Gazette Mail got an interesting mix of stories relating to the coal industry … I think it was especially interesting if you came across these stories, like I did, reading the print edition (Yes, we still do one of those — and if you really want to support independent journalism in West Virginia, click here to subscribe. 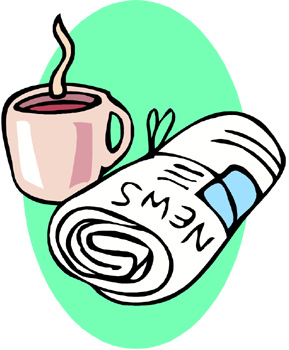 These are tough times for the newspaper business, and that’s all I’ll say in this totally self-serving and shameless plug). First, at the top of page 1A, we have Rick Steelhammer’s story about students from Lutheran volunteer groups delivering clean bottled water to the folks in the Prenter area of Boone County. Now, Boone County is West Virginia’s top coal-producing county. 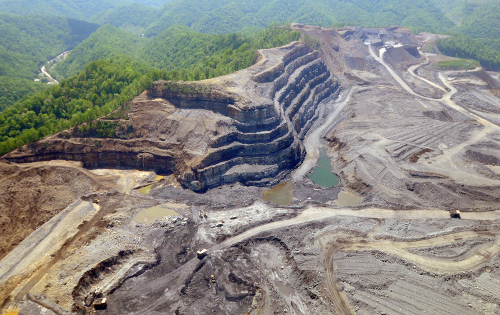 It’s also the state’s top producer of strip-mined coal, and home to the largest United Mine Workers-organized mountaintop removal complex, Hobet 21. So, how could a county where the coal industry is so successful need a bunch of kids to bring clean water in for residents to drink? Seriously — how could this happen? March 20, 2009 by Ken Ward Jr. Toxic pollution decreased across the country in 2007. But the industry with the largest toxic emissions remains … you guessed it: Mining. The metal mining sector reported nearly 1.2 billion pounds of toxic releases and waste disposal, according to disclosures companies filed with EPA.Â Coal mining reported far less, but still more than 13.4 million pounds of emissions and waste disposal.Â Both sectors cut their emissions, coal by about 10 percent and metal mining by 8 percent. (Electric utilities — mostly coal-fired power plants — are aÂ close second, btw). 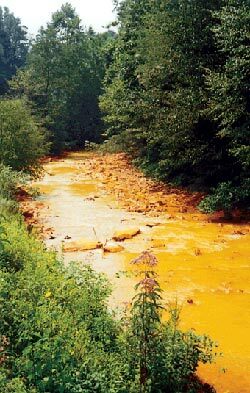 But the huge total toxic figures reported by mining explains why the industry fought long and hard to avoid having to report its pollution to the TRI program. The National Mining Association Web site has some information on the industry perspective. All of the TRI data is available here, and state-by-state fact sheets here. The public can also do searches and queries on TRI data at EPA’s TRI Explorer site. 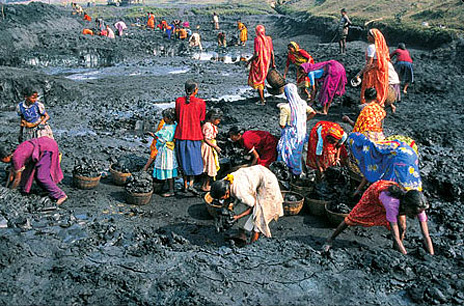 March 15, 2009 by Ken Ward Jr.
Women make up a majority of the menial labour force in the mining industry. Photo from Centre for Science and Environment. We’ve talked before on Coal Tattoo about coal-mining in China, where the safety and health conditions are simply unbelievable. (See previous posts hereÂ and here). Underground fires rage, buildings cave in, greenery shrivels. And for the people living in the Raniganj coal belt, life hinges on a sliver of hope and the rich mineral they gouge out of the earth, legally or otherwise.